All Nebraska Drug and other Problem-Solving courts are governed by the Nebraska Supreme Court Committee on Problem-Solving Courts under the direction of the Nebraska Supreme Court. Members include representatives of courts, probation, law enforcement and the legal community along with judges, prosecutors and defense attorneys. 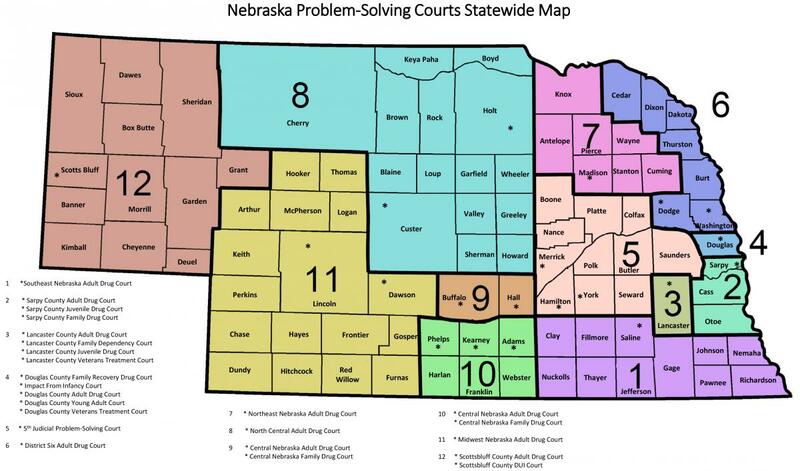 Nebraska problem-solving courts are an institution of the Nebraska Supreme Court utilizing innovative court programs through which individuals and families thrive, and all Nebraska communities become safer. Problem-solving courts operate within the district, county or juvenile courts and include programs established for the treatment of problems related to substance abuse, mental health, and domestic violence. Problem-solving courts are post plea or post adjudicatory intensive supervision treatment programs designed for high risk and high need individuals. Nebraska Problem-Solving Courts can only be established with the approval of the Nebraska Supreme Court. The purpose of the program is to reduce recidivism by fostering a comprehensive and coordinated court response using early intervention, appropriate treatment, intensive supervision, and consistent judicial oversight. Problem-solving courts adhere to the 10 Key Components approved by the National Association of Drug Court Professionals and best practice standards. Click on the above map of locations to enlarge. A specially designed court calendar or docket, the purposes of which are to achieve a reduction in recidivism and substance abuse among nonviolent substance abusing offenders and to increase the offender’s likelihood of successful habilitation through early, continuous, and intense judicially supervised treatment, mandatory periodic drug testing, community supervision, and use of appropriate sanctions and other rehabilitation services (Bureau of Justice Assistance, 2005). DUI drug treatment courts programs utilize the drug treatment courts model with impaired drivers. A DUI drug treatment courts is a distinct court docket dedicated to changing the behavior of the alcohol/drug dependant offenders arrested for Driving While Impaired (DWI). The goal of DUI drug treatment courts is to protect public safety by using the drug courts model to address the root cause of impaired driving, alcohol and other substance abuse. With the hard-core drinking driver as its primary target population, DUI drug treatment courts follow the Ten Key Components of Drug Courts and the Ten Guiding Principles of DWI Courts, as established by the National Association of Drug Courts Professionals and the National Drug Courts Institute. DUI drug treatment courts operate within a post- conviction model. The DUI drug courts team uses a team-oriented approach to systematically change participant behavior. Compliance with treatment and other court-mandated requirements is verified by frequent alcohol/drug testing, close community supervision, and interaction with the judge in non-adversarial court review hearings. During these review hearings the judge employs a science-based response to participant compliance (or non-compliance) in an effort to further the team’s goal to encourage pro-social, sober behaviors that will prevent DUI recidivism (Loeffler & Huddleston, 2003). DWI courts often enhance their close monitoring of offenders using home and field visits, as well as technological innovations such as Ignition Interlock devices and the SCRAM transdermal alcohol detection device (Harberts & Waters, 2006). Family dependency treatment courts is a juvenile or family courts docket of which selected abuse, neglect, and dependency cases are identified where parental substance abuse is a primary factor. Judges, attorneys, child protection services, and treatment personnel unite with the goal of providing safe, nurturing, and permanent homes for children while simultaneously providing parents the necessary support and services to become drug and alcohol abstinent. Family dependency treatment courts aid parents in regaining control of their lives and promote long-term stabilized recovery to enhance the possibility of family reunification within mandatory legal timeframes (Wheeler & Siegerist, 2003). A juvenile drug courts is a docket within a juvenile courts to which selected delinquency cases, and in some instances, status offenders, are referred for handling by a designated judge. The youth referred to this docket are identified as having problems with alcohol and/or other drugs. The juvenile drug courts judge maintains close oversight of each case through regular status hearings with the parties involved. The judge both leads and works as a member of a team that comprises representatives from treatment, juvenile justice, social and mental health services, school and vocational training programs, law enforcement, probation, the prosecution, and the defense. Over the course of a year or more, the team meets frequently (often weekly), determining how best to address the substance abuse and related problems of the youth and his or her family that have brought the youth into contact with the justice system (BJA, 2003). Young Adult Court is a judicially supervised program that provides a sentencing alternative, for youthful offenders up to age 25, who have been charged with a felony offense and required to participate in a program of selective assessment and rehabilitative services administered by multidisciplinary agencies. Key aspects of the Young Adult Court are community supervision, substance use treatment, mental health assistance, education, employment and frequent drug testing. The goal of this 18 to 24-month program is to stabilize participant’s lives by providing tools for success, thus reducing recidivism. In conjunction with Justice Reinvestment, the Nebraska Supreme Court’s Problem-Solving Court Committee is presently working on standards for reentry (post incarceration) courts with a targeted completion date of April, 2017. National research has supported mental health courts as effectively reducing recidivism among participants, improving mental health outcomes, and reducing the length of incarceration for participants. (Mental Health America, 2009) The Nebraska Supreme Court’s Problem-Solving Court Committee is presently working on standards for mental health courts. Nebraska Veterans Treatment Courts are designed to reduce recidivism by fostering a comprehensive and coordinated court response using early intervention, appropriate treatment, intensive supervision, and consistent judicial oversight. Nebraska Veterans Treatment Courts adhere to the Nebraska Veterans Treatment Courts Best Practice Standards. Veterans Treatment Courts operate under a team approach where a judge, prosecutor, defense counsel, coordinator, community supervision officer, law enforcement, treatment provider(s), Veterans Health Administration, and other key team members work together to design an individualized program for each participant. Compliance with treatment and court orders is verified by frequent alcohol/drug testing, close community supervision, and judicial interaction in non-adversarial court review hearings. Veterans Treatment Courts enhance close monitoring of participants using home and field visits. The State of Drug Courts Research: Moving Beyond "Do They Work?"